Mrs. Rios Teaches: Open House...If You Feed Them, They Will Come! Open House...If You Feed Them, They Will Come! I just finished my second week of school, and we had our Open House for the students and their families on Thursday night. I think I am finally getting a handle on Open House and speaking to groups of adults (read: anxiety, heart palpitations, dizziness, here). This was the first time in 18 years I had no butterflies or nerves, at all. I really just had fun mingling and speaking with the parents of my new students. Here are some pics of some student work I had up for the parents to see. 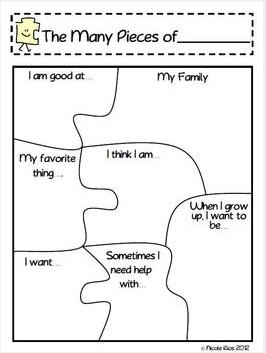 This "The Many Pieces of Me" Activity is available in my Tpt store, Here. 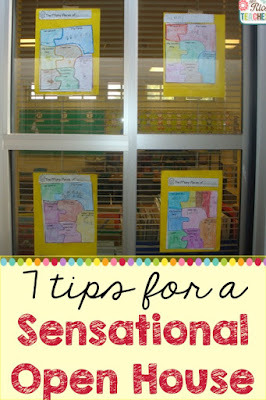 I also have a couple of tips I thought I would share that have made Open House a success for me. 1) Incentives! Sometimes parent participation is lower at my school than we would hope for. When I was first teaching, I remember an OH that totaled 8 people....including myself! Sad. Very sad. No homework passes: Free, easy, and the kids love em'. If their parent shows up, they will have a No Homework Pass on their desk the next day. The promise of food and drink: In the past, I have offered juice boxes, small bottles of water, and plates of cookies. I like the "party" type atmosphere it created. However, the last couple of years, I have been reluctant to do this because of so many food allergies. So, proceed with caution here. Open House Raffles: I normally start OH with a Scavenger Hunt. The kids take their parents through the classroom and show them the important work and systems that we have created in our room. It takes up the first 10-15 minutes while we are waiting for families to file in. After the students complete the last task on the Scavenger Hunt, they are directed to bring their completed "hunt" to me. I, in turn, gave them a raffle ticket. In the past, I have raffled-off gift cards to Toys-R-Us, and had almost 100% attendance! Gift cards were anywhere from $15-$20 dollars. I know, I know...that is just us spending more of our own money. 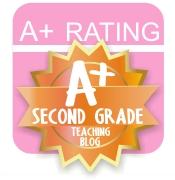 But, to me, it was worth it, because it gave me a chance to clearly communicate my expectations to parents right from the beginning of the year. However, this year, my budget was tight, because as you might remember, I decided to do a classroom mini-makeover. So, this time, I still gave kids tickets, but held the raffle the next day, with the prize being something from my Treasure Chest. Results? The kids were still very happy! My wallet was also very happy. My parents love being able to sign up for conferences right at Open House! 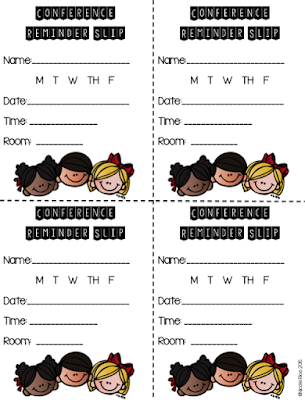 Here is a cute Conference Reminder Slip FREEBIE for you. Click below to download. 2) Babysitting! The last two years, a classified school employee has taken all of of the kids next door to watch a movie during the teacher presentation portion of OH. This year, she had some 60 kiddos in there. But, it works BEAUTIFULLY! It is so nice to be able to discuss standards, procedures, homework, etc... in a quiet, distraction-free, room. At our school, grade levels all choose different nights for OH. That way, parents are not forced to choose which class to visit. If your school does this as well, maybe you and your grade level can babysit for another grade level, who is having their OH on a different night. They can then return the favor on your night. You can make this work. You just might have to get creative. 3) Don't get trapped! Don't get me wrong. I love parents who want to know how their child is doing. But, I think we can all agree that OH is not the time, or place, to discuss this. I give myself an "out" by printing up a quick Conference Request sign-up sheet and posting it in the room. That way, if a parent starts to make personal inquiries, I can just direct them over to the sign-in sheet. 4) Make each child a star! I use my Flip Camera to take snippets of student-narrated video of our classroom routine/procedures. I always make sure each child is featured in someway. Every parent loves to see their child onscreen! It is also a nice 5-8 minute breather for me! Just a note. Make sure you have parent permission before you make your video. At our school, a Photo/Video permission form is included in their first day packet. This year, I only had one child whose parent has asked that their child not be photographed. 5) Make OH Prep easy! I have all my OH sign-in sheets, parent flyers, ideas, in one folder on my desktop. Most years, all I have to do is change a date on a document and I am ready! 6) Ask for Help: I discovered this system for asking for classroom donations from my daughter's Kindergarten teacher many years ago. My daughter is in 6th grade this year. But, I still use this great poster to ask parents to help out with things that we will need all year long. The basic premise is that 1) parents decide what they would like to donate 2) take a post-it reminder from that section, and 3) sign their child's name on the poster. This system makes it easy to know how much of each item I can anticipate. I have had a lot of success with this system. I hope you will, too. 7) Update 8/7/14: One last thing! 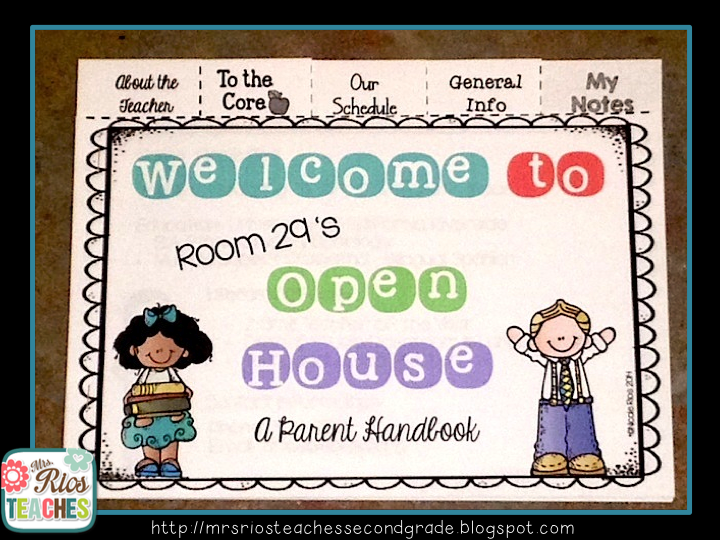 I made this Open House/Back to School Night Parent Flip Book to share with my parents. I LOVE it! I like that they will have all this information in one place! Great news! 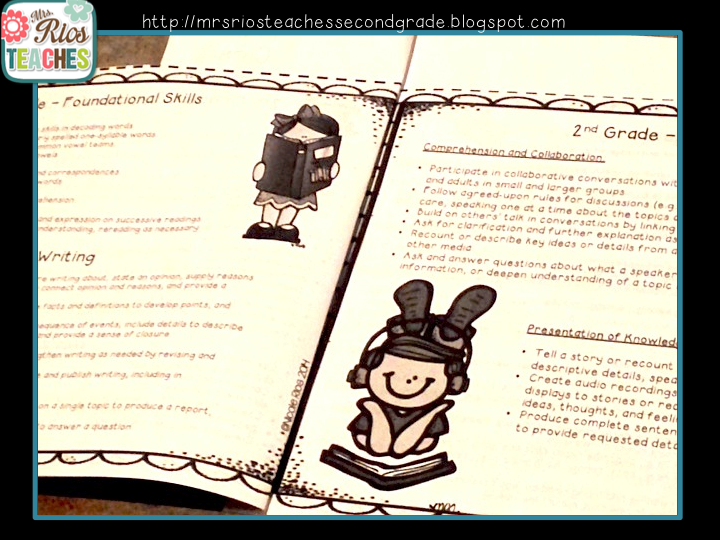 I have made this book EDITABLE, and it is now available in my store for grades K, 1, 2, 3, 4, and 5! Click on any of the images to find out more. 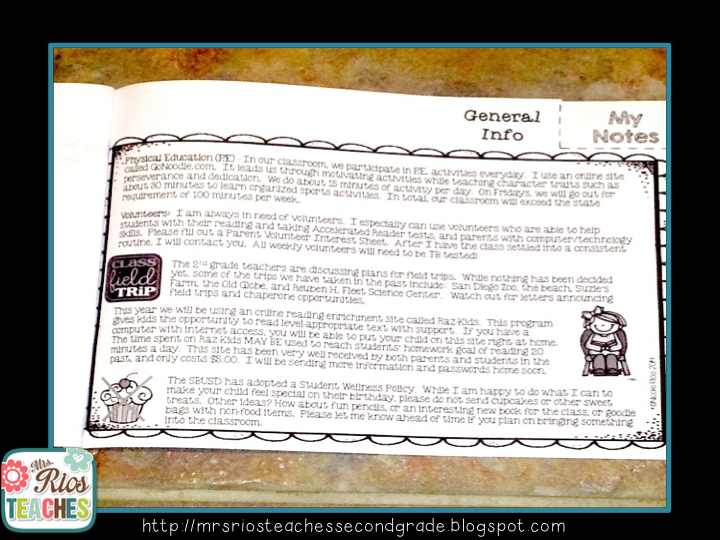 Here is how my flip book turned out. 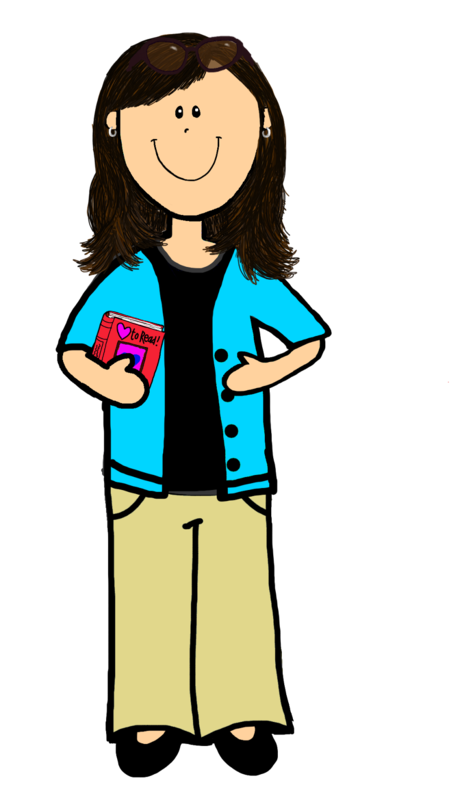 First, I shared a little about me. 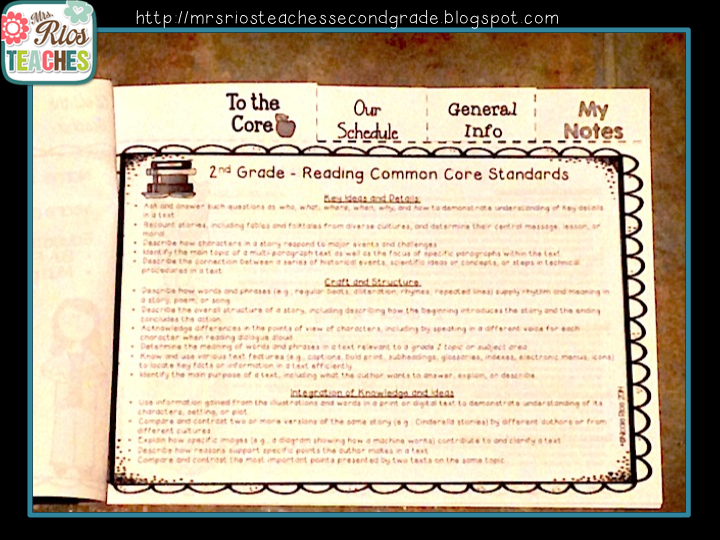 Then, I included all the ELA and Math Common Core Standards for 2nd grade. 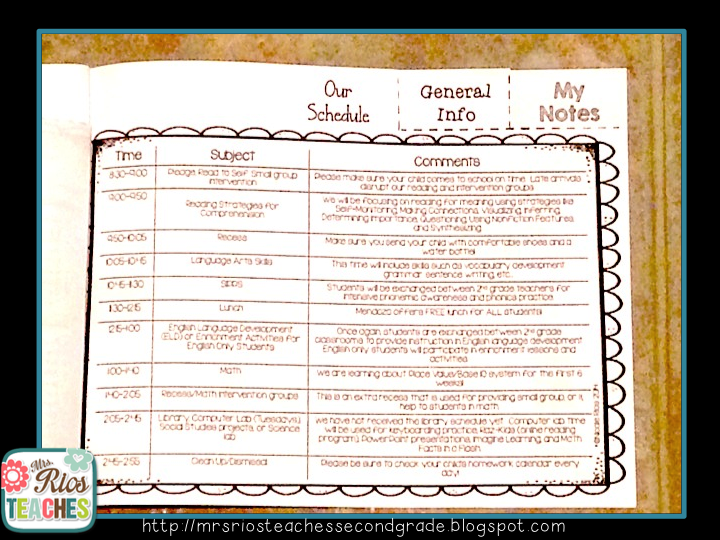 Then, I included a detailed schedule for our classroom. I chose a General Information page for my 4th tab! Finally, I chose to put a letter template at the end. 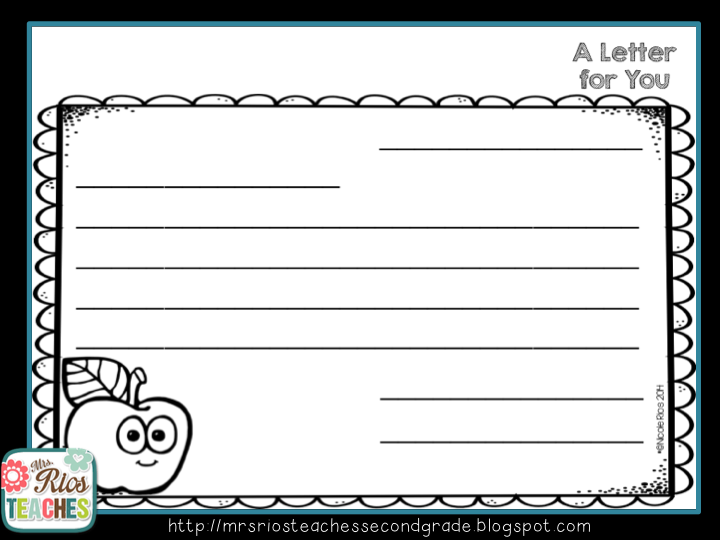 I haven't decided whether students will write a letter to their parents, or if parents will write a letter to their child, rip it off, and then leave it on their child's desk for the next day. 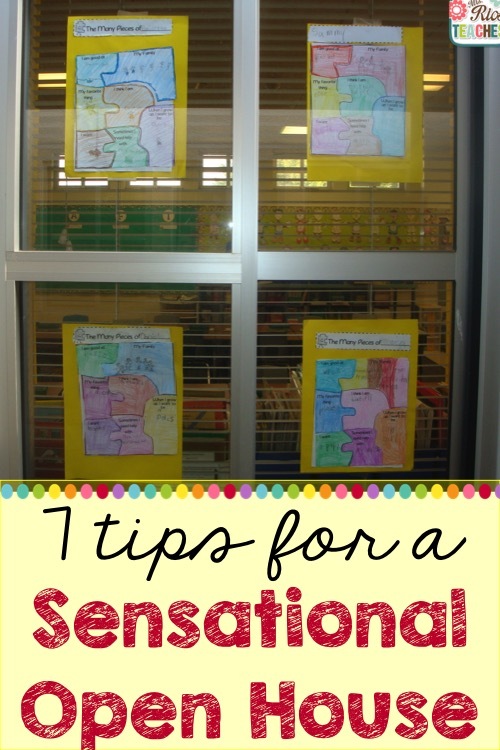 Looking for more back-to-school ideas and inspiration? Follow me on Pinterest! Ok, well that's all I can think of for now. I hope you all have a wonderful new school year. I hope you received it, Cortney. Let me know if I need to resend. If you have time I would also like a copy of your power point. I always put up a wish list too. I've haven't thought to ask for ink, but I am definitely adding that to the list this year! With all the printing I do at home, that would be extremely helpful! Hope you have a GREAT year!! I believe I have sent the ppt to everyone. Let me know if you did not receive it. I will resend it! May I also have a copy of your Powerpoint? I would love to get the Powerpoint too! I'd love a copy of the ppt too. Thank you so much! Have a great year. I love all your great ideas! Does the ppt you send include the Spanish version as well? 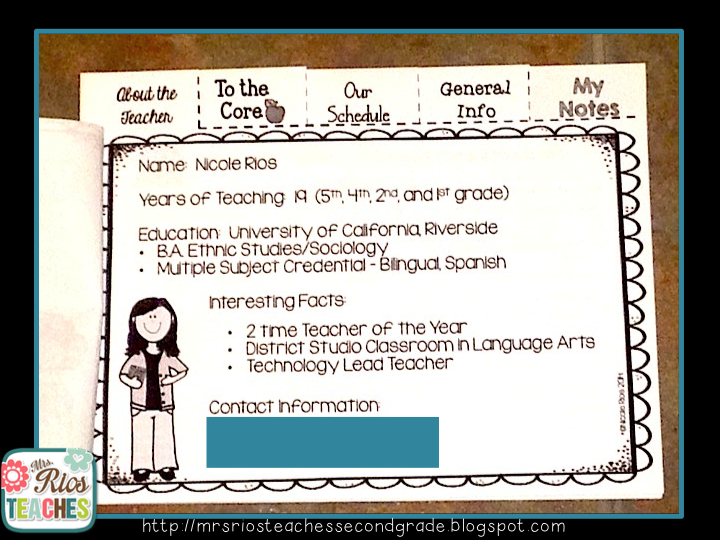 I would love to have both the Spanish and English version as I am a 1st grade dual language teacher. Thank you so much! I will definitely be using some of these ideas! Can't wait to see a copy of the PowerPoint. I would love the powerpoint. Thanks!! I would love a copy too! I would love a copy of your power point too! I would love a copy of your OH PPT. I am always trying to improve mine! Thanks! I am sending it right now! I hope I just forgot that I already sent it, otherwise I am REALLY late! I would love to have a copy of your PPT. I would love a copy of your OH PPT. Please send it to mashondaturner@gmail.com Thanks! Sent to everyone up above! Yay! Found you on Pinterest! These ideas are amazing! I'm starting my 3rd year and using coupons for the first time. I'll definitely be offering them as incentives for parent participation. Thanks!! Just found you on pinterest and loved these ideas! 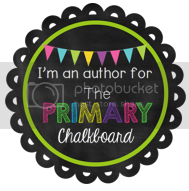 Would love a copy of your ppt! My email is jrivera@donniasd.net Thanks! I would love a copy of your powerpoint! My email is asteel@stetson.edu! THANKS!! I wiould love a copy of your power point. My e mail is mitduc@aol.com. Thanks so much! I would love a copy of your powerpoint. Email is aggiesal@yahoo.com. This looks great! We have OH next week, and I'd love a copy of your ppt. 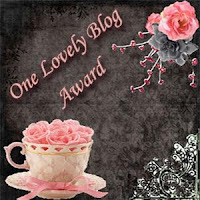 paulatome@yahoo.com Thank you!